a-z collective is comprised of two multi-disciplinary artists, Amanda McKinney and Zorica Krasulja. Themes of space, time and nature draw these two artists together. They exhibit paintings, sculpture, paper making and digital photographic transfers. Their works encompass a variety of media with both traditional and contemporary processes. 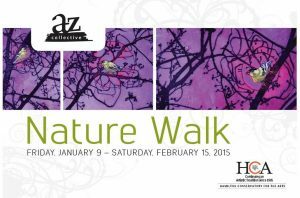 The exhibition, Nature Walk, serves as a reminder to take time to connect, find peace and relax with nature. Never more needed then in these fast paced times, when it seems nature is a disappearing element of our existence.